QUEZON CITY, Philippines - The recently concluded Totus Tuus Journey at the Holy Spirit Parish in BF Homes, QC was launched last October 7, 2017 on the feast of the Our Lady of the Rosary and culminated last June 9, 2018 on the Feast of the Immaculate Heart of Mary. This made the TTJ Batch 90 with 23 participants of different ages, church groups and professions. The youngest of the group is the grand-daughter of the late Paz Soriano, a pioneer-lay-TTJer and facilitator. The group met Friday nights, having coined TGIF TWIF Mary for it! It was the first TTJ ever done in the parish courtesy of the collaboration of the Montfort Missionaries and 7 parishioners, namely, Arnel, Criselda, Abraham, Irene, Maricar, Elizabeth and Geraldine, who are TTJers turned Associates of Mary Queen of All Hearts. The seven were mentored by Fr. Mario Belotti, SMM and Fr. Paul Arnel Lucero, SMM in their own journeys. The sessions of Batch 90 were held at the parish hall. Fittingly ‘outside classroom’ activities were also done by the group such as visit to Wisdom Sisters in Cubao, Quezon City. It was perhaps a long, yet steady paced meaningful pilgrimage of faith that started with unclear yesses from the handpicked participants but only to have led to undoubtedly a loving and sweet journey with our Blessed Mother during the preparation days, for their big YES on their consecration to Jesus, come June 9, 2018. All in this together were our missionary priest-facilitators, sharing their own experiences and guiding the TTJers through the process. To mention, they were Fr. Norwyn Baydo, SMM, Fr. Arnel Pagaduan, SMM, Fr. Benjie Notarte, SMM, Fr. Rene Bustillo, SMM, Fr. Sherwin Nunez, SMM, Fr. Federick Yumang, SMM, Fr. Paul Arnel Lucero, SMM and Fr. Richard Magararu, SMM. Mainstay and icon TTJer facilitators Ana Marie Fondevilla, Milo Casals, Evelina Deblois and Seneca Nipa came too. The TTJers had a recollection with confession and Holy Mass at St. Arnold Spirituality Center in BF Homes. The fruitful recollection gathered the insights and sentiments of the journey that has been. Further, it was to bring everyone closer to the meaning of consecration and living a consecrated life, the Marian way. Fr. Sherwin Nunez, SMM led the group through this recollection. As the days grew closer to consecration, stronger bonds were discovered, healing grace came when needed most and happy memories were built. It was a raining yet beaming delightful day. Sanctifying and dedicating day. A new batch was born. Leaving the comforts of their homes for a ‘minute’ after having their own life journeys within the Totus Tuus Journey, laden with both happiness and tears, they now offer it all. ‘I am all yours’. Finally, Mary is in charge, and all dressed in white they consecrate their lives to the Lord our God. Fr. Richard Magararu, Delegation Superior, Fr. Rene Bustillo and Fr. Federick Yumang, con-celebrated the rites of Consecration and Eucharistic celebration at the Holy Spirit Parish Church. The music for the celebration was provided by the choir composed of the children of the newly consecrated and renewing TTJers. Rain showers were persisting during the fellowship that was held at 28 Encarnacion St. It was a hearty dinner to fellow journeyers who were unmindful of the weather by then, but only with the message left in the heart that the journey has just begun: My Marian Consecrated Life. 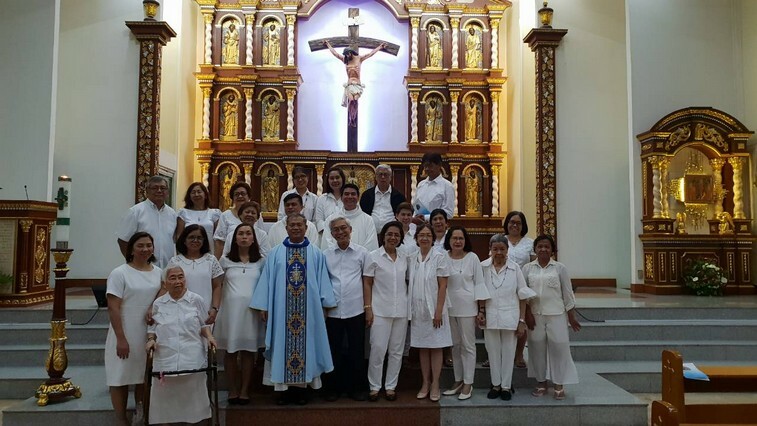 There were two newly consecrated TTJers in Batch 90 who had their Consecration at the Montfort Center of Spirituality for June 9, 2018 was not possible for them. Fr. Federick Yumang, SMM, National Director of the Association of Mary Queen of All Hearts officiated their Consecration rites and Mass on their solo Consecration (done on different dates).